This is something I feel passionately about. It’s also something I know about, as the science of reading is one of my “things”. 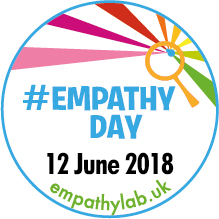 In fact, this is a re-posted blog for Empathy Day (today), a day organised by Empathy Lab to encourage us to #ReadForEmpathy. Without empathy, the world would be a cold, cruel place full of humans walking around in their little bubbles and never engaging. And reading stories about things that happen to people (or even animals, because that opens us to explore our own emotions and try to identify) helps us have that empathy. Some people try to argue that only fiction does this. Rubbish, I say!I’ve studied the research and thought about it a great deal. This post explains. From the age of around four, when most humans start to develop Theory of Mind (ToM), we learn that two people may not feel exactly the same in what looks like the same situation. We learn to guess, though rarely perfectly, what this person might be feeling in this situation, based partly on what we think we would feel but more accurately on what we learn that various other people feel in those situations. We learn to see patterns in human behaviour and to draw conclusions. But let’s be clear what we mean by story. Because it’s sometimes misunderstood. 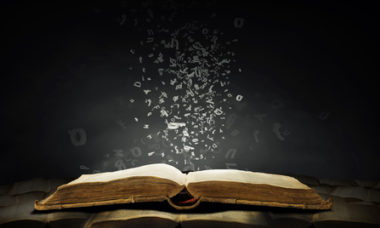 Stories are equally stories when they are true stories. When told well, they are equally powerful in producing empathy. There is no research that contradicts this. The true stories of suffering in Nazi concentration camps or in the Black Hole of Calcutta or in Syria or of human trafficking today are stories with immense power to move us and widen understanding. Stories of anyone in a difficult or different situation have the power to transport us into other minds. To do this, the stories must be well told, following the rules of great story-telling, gripping us emotionally and deeply, so that we can begin to feel a true connection to the people in them. The same applies to made-up stories. A badly-told piece of fiction would do as bad a job of creating empathy as a badly-told piece of non-fiction. We would not engage well with either. And it’s that act of engagement or narrative transportation that triggers the empathy. Keith Oatley, in Such Stuff of Dreams, and with his colleague, Raymond Marr, in various research papers, posit this, I believe correctly. The act of narrative transportation is powerful and mind-changing. When those stories are “told”, as long the stories involve people, made real by words, rather than how many bullets are in the walls and what date this happened or what the name of the generals were, they have equal power to move us and increase our understanding for the people concerned, whether the story describes people who existed or an imaginary representation of those who went through these events. However, some people then make a leap which does not stand up. (Oatley and Marr seem to make this leap, too.) They suggest that only fiction does this. I know the arguments offered and I’ve argued against them before. I’ve read the research that purports to show it. It doesn’t. It shows that fiction builds empathy. It says nothing (though it sometimes looks as though it does) about whether non-fiction doesn’t. It measures great fiction (such as a Chekov short story) against dully non-fictionalised, badly written non-fiction that uses none of the narrative devices of great story-telling. Of course, it does this not maliciously but because research has to have concrete things to compare. But all it does is compare great writing with poor writing. It also compares “literary” fiction to non-literary fiction. Now, that’s interesting because people don’t seem to pick this up – because it would look elitist? But let’s at least take from it that what is important for this act of transportation may be the quality of the writing. As I say, stories well told. There is no evidence that non-fiction well told cannot be a valid and powerful route to improved empathy, just as fiction well-told can be. I could offer many, many more true stories that must be as likely to build empathy (and did in me) as fiction. Does it matter if people continue to claim that only fiction produces empathy or that it does so “better” than non-fiction? Yes, it matters a lot. It matters because I think the research comes to a misleading conclusion as it doesn’t compare what it purports to compare. It matters because it lauds fiction readers over non-fiction readers, suggesting that they are necessarily more empathetic. It matters because a more sensible thing to do would be for readers or teachers or parents or librarians to look at books and identify where empathy lessons might lie, where the narrative transportation happens, what goes on in our brain and minds and hearts when we do that brilliantly human thing of tuning into another person’s emotions and experience. That the job of fiction is more largely and more often to create empathy than is the job of non-fiction – non-fiction has some other concerns as well. Numerically, it’s likely that more fiction books would score highly on an empathy-rating than non-fiction books – because non-fiction includes a great number of books the job of which is nothing to do with boosting empathy: books about how to build a wall, for example. 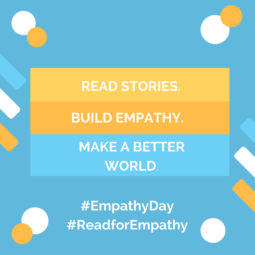 Fiction, well-told, does an amazing job of boosting empathy and it’s very worthwhile to consider that as one of the great reasons for reading fiction and it’s also worthwhile, as EmpathyLab does, to offer schools ways to bring empathy skills explicitly into work with books. It’s stories that do this job, stories powerfully told, stories that offer insights into other people’s emotions and thoughts, stories that are about people like us and about people not like us. True stories well told can do an equally brilliant job of boosting empathy and many readers of all ages relate to them better for knowing that they are “true”. 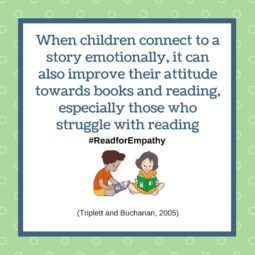 So don’t stop your children or pupils reading non-fiction on the basis that only fiction boosts empathy. 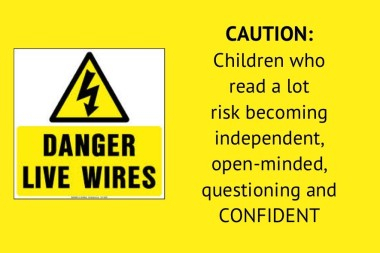 Just help your children choose great great books and give them time, place and permission to bury themselves in a wide range of stories. I have no personal axe to grind, by the way. I read both fiction and non-fiction pretty equally. As a child, I probably read more fiction, though I could be wrong. I certainly number both amongst my favourite and most memorable reads. I write non-fiction at the moment, as it happens, but I’ve also written many novels and hope to go back to that. Empathy comes from well-written stories of people feeling, experiencing, doing. My message is: read great stories, stories that draw you in and connect you to other people’s emotions and experience.